The term “cohousing” was coined by architects Kathryn McCamant and Charles Durrett in a 1988 book profiling dozens of successful communities of this sort in Scandinavia. There are now over 120 cohousing communities in North America. All have part of their land in private homes, and the rest of the property held in common. Typical shared amenities are open space, vegetable gardens, orchards, play spaces, and a “common house” (community hall) where residents meet, eat, and socialize. Individually owned homes provide privacy and personal freedom. Common areas and facilities foster a sense of community and afford many opportunities for shared practical and social activities. 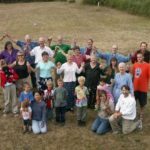 RoseWind Cohousing is in Port Townsend, Washington, a progressive small town of 9,000 situated on the northeast corner of the Olympic Peninsula. Seattle is 2-3 hours away by car or bus and ferry. See maps of the Olympic Peninsula and the Quimper Peninsula. Started in 1988, RoseWind is a nine acre community inside the city limits. Our views are pastoral (we border on a vineyard), yet we are minutes from everything in town. Local amenities include an excellent food co-op, movie theaters, a Carnegie library, farmers’ market, locally brewed beer and cider, seasonal festivals, and many music and arts activities. Walking, biking and very short car rides are the norm here. The climate is mild, with only 17 inches of precipitation annually. Starting in 1988, our original members met and worked for years before the first house was built. The group purchased land from several sources, established RoseWind as a non-profit association, worked with the city to comply with regulations and build the required infrastructure for the RoseWind Planned Unit Development, which was approved in 1993. Once prices for the lots & membership were established, additional members joined the early pioneers, and began to build houses. In 1999 we were able to break ground for the RoseWind Common House. We made significant use of volunteer labor, and completed the building in 2001. The paved patio and walled garden around it were added later. Our first community building project, completed in 1997, was a unique garden shed to house the agricultural well-water pump, and provide storage for garden supplies. RoseWind is a Homeowners Association, incorporated as a nonprofit corporation in the State of Washington. Various committees and task forces are organized to meet our changing needs. Our Master Declaration of Covenants, Conditions and Restrictions spells out financial and property matters; our Bylaws describe issues of governance. RoseWind makes decisions using a consensus process which provides members with the opportunity to voice concerns, make proposals for change, and offer differing opinions. We have been using and improving this model for over 25 years, and have an experienced team of facilitators to guide our community meetings. Ongoing expenses for maintenance and improvements of the common holdings are shared through the work that we do ourselves and by annual assessments, with homes and lots maintained by the individual homeowners. The annual budget, based on a core of ongoing well understood expenses, is determined by consensus of the members and as of 2016, the annual assessment is under $1,300 per household. We rely on members’ efforts to keep costs down. We have a modest work participation requirement and schedule regular work parties. Cohousing is not for everyone. It is a lot of work and requires a willingness to compromise. Some people find they prefer more independence. In cohousing, it helps to be patient, flexible, curious and helpful. The benefits are not just the common amenities, but the human community which results from frequent interactions with one’s neighbors. Over time we build many strong friendships, and share both personal challenges and joys. 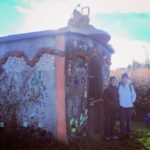 Cohousing is not a good choice as a second or part-time home, as that seriously reduces both the ability to do one’s share of the work and the benefits of being part of such a community. Another factor to consider is the ability to earn a living, if necessary, in Port Townsend’s limited economy. On a map, Seattle might seem close, but it is too far for a daily commute. Since RoseWind is fully built, the way to become a member is through a resale. Since we only occasionally have a house for sale, it is advisable to get to know us ahead of time; this will help you make an informed choice if a resale comes up. Contact us and tell us who you are and what your interest is, along with your timing. Our Outreach committee will let you know what is or may become available, and will gladly answer questions by email. If you are seriously interested, you should visit us. Visitors are encouraged to join us for community social events, to tour the commons, and meet community members. You can ask questions in person, and gain a much better sense of our community. If your schedule permits, please attend a community meal or business meeting. To arrange a visit, please email well ahead of time: two weeks notice is appreciated. We have no community guest room, but there are many convenient options in town (see www.ptguide.com).